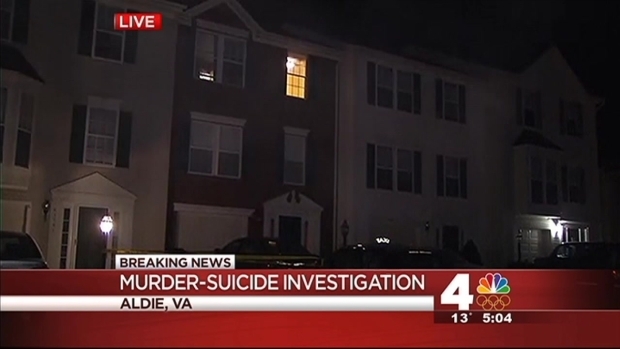 Husband, Wife Dead in Apparent Murder-Suicide in Aldie, Va.
A grandmother and two teenagers survived an apparent murder-suicide that left a 43-year-old taxi driver and his wife dead inside an Aldie, Va., home, said the Loudoun County Sheriff's Office. Neighbors reported hearing shots fired at the townhome in the 41700 block of Eloquence Square around 10:30 p.m. Tuesday. When the first deputy arrived at the scene, he heard two additional shots and called for backup. Once deputies were able to enter the home, they found the bodies of the man and woman. Husband, Wife Dead in Apparent Murder-Suicide in Va.
A grandmother and two teenagers survived an apparent murder-suicide that left a husband and wife dead inside an Aldie, Va. home, said the Loudoun County Sheriff's Office. Loudoun County Sheriff Mike Chapman said the two teens found inside the home were not injured, but their grandmother had been shot in the arm. She was transported to a local hospital with serious injuries, but is expected to be OK.
News of the shooting deaths shocked residents of the quiet community. "I've been here seven years, and it's really quiet neighborhood, very family-oriented, lots of children," said resident Katie Santarelli. "I was very surprised when I read it." A grandmother and two teenagers survived an apparent murder-suicide that left a husband and wife dead inside a home in Aldie, Va., the Loudoun County Sheriff's Office said. Authorities are still working to determine what happened inside the home. The sheriff's office says the shooting is an unusual occurrence for the county. There was only one homicide in Loudoun County in 2013.